The actor Bandô Shûka I held the name of Bandô Tamasaburô I from the 11th lunar month of 1824 to the 10th lunar month of 1839. The actor Bandô Minosuke IV held the name of Bandô Tamasaburô II from the 11th lunar month of 1844 to the 1st lunar month of 1869. Born in Tôkyô en 1883. 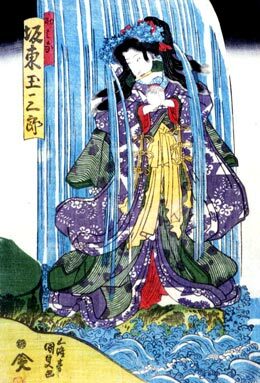 Fifth child and daughter of the zamoto Morita Kan'ya XII, she started to learn many arts from an early age: Nagauta, Tokiwazu, koto, ikebana, tea ceremony and Buyô. 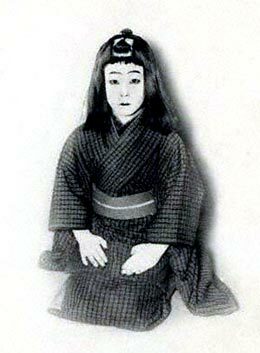 She joined in March 1888 a Kabuki women troupe and took the name of Bandô Kimie at the Shintomiza. 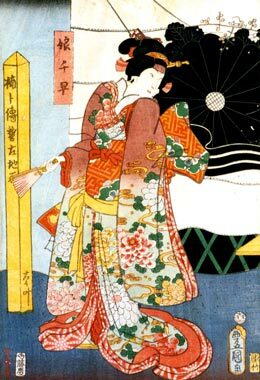 She took the name of Bandô Tamasaburô III in March 1889 but the Kabuki women experience was a failure and the troupe had to disband. 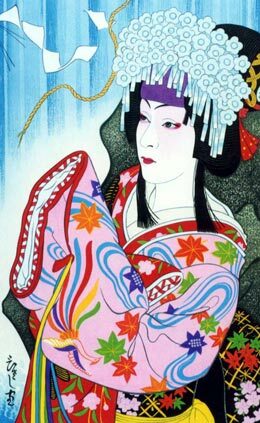 She went to New York in 1904, with a troupe of Japanese artists. Her performances were successful and she decided to settle in the USA to teach Buyô. She died in New York in February 1905. The actor Morita Kan'ya XIV held the name of Bandô Tamasaburô IV from July 1914 to December 1925. The amazing onnagata Bandô Tamasaburô V is the current holder of the name since June 1964.